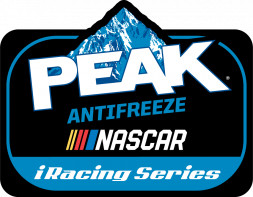 17 races have been completed and now only 1 remains on the 2018 NASCAR PEAK Antifreeze iRacing Series as the best in sim-racing head to the virtual Homestead-Miami Speedway this Tuesday, October 23. Career years for Nick Ottinger, Keegan Leahy, Bobby Zalenski and Nickolas Shelton were cut short after the race at Dover International Speedway where they were all officially eliminated from contention. 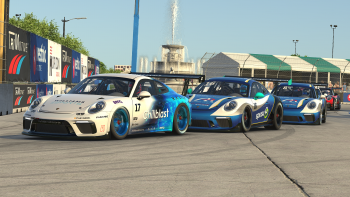 Following the same Playoff format as the last 2 seasons, the 4 drivers who advanced out of the Round of 8 either from race wins or by points will go head to head for the $10,000 purse, amongst other prizes. Let’s meet the Championship 4. While he’ll start tied with his fellow 3 championship hopefuls, Michael Conti’s performance over the last 3 months has lobbied to make him the title favorite. What started out as a slow 2018 campaign has steadily evolved into shades of the championship form we saw when he took home the 2014 series title. 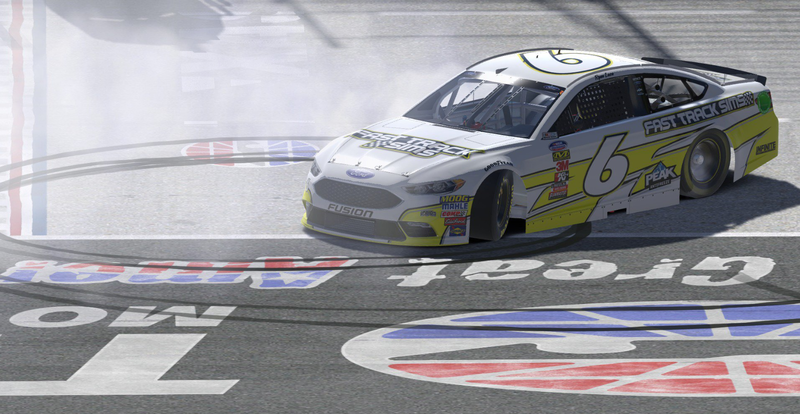 Conti’s Championship 4 ticket was punched in the opening race of the Round of 8 when he took home his first win of the season at Darlington Raceway, automatically advancing to the Homestead finale. He also played a critical role at Dover 2 weeks ago when he took a race win, and an automatic bid into the final round of the playoffs, away from Bobby Zalenski in the dying laps en route to his 2nd win in 4 weeks. 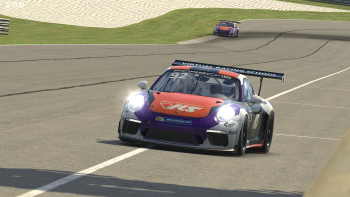 Michael Conti is looking for a first career win at Homestead-Miami Speedway as he seeks to become the 2nd ever multi-time champion at sim-racing’s top level. The driver who has competed in the series since 2013 finally found victory lane for the first time in his career this year and it just so happened to be on the biggest stage. 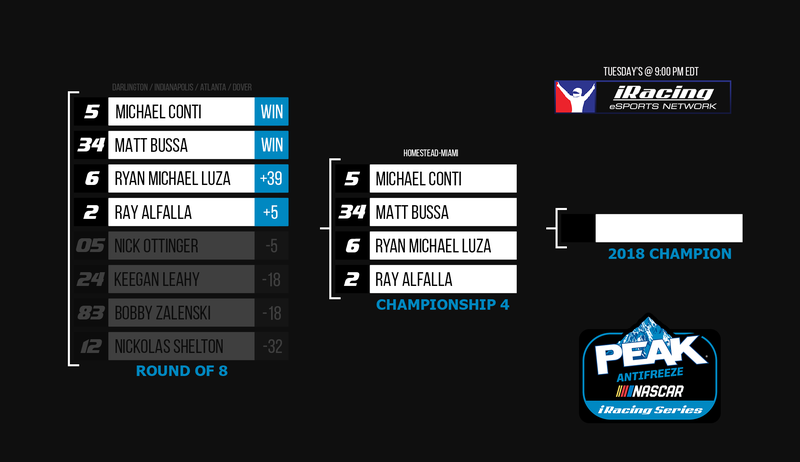 Bussa prevented Michael Conti from getting a 3rd Round of 8 win by holding him off in the closing laps at Atlanta Motor Speedway to punch his ticket into the Championship 4. Bussa transfers into this finale as the #2 seed, but the numbers suggest he’s the underdog of the group. Not only is Matt Bussa the only driver of the Championship 4 who doesn’t have a NPAiS title to his name, but his season as a whole has trailed behind those he’s facing up against. Bussa has fewer Top 5’s, Top 10’s, and the lowest average starting and average finishing position than his title competitors. If determination was a measurable stat, that may be his best weapon. This is the closest he’s ever gotten in his iRacing career, and you can bet he wants this bad. Bussa has a legitimate shot at the upset. After taking home the 2017 championship in his rookie tenure Ryan Luza was on top of the world. His walk-off race win in last season’s Homestead finale was his 5th on the year, the most out of all drivers. He has the unique opportunity to replicate that feat for a second-straight season as he looks for win #5 on this season come Tuesday. The 1.5-mile Homestead-Miami Speedway has never been a place that drivers looked to with certainty, however. No driver has ever won at Homestead more than once since 2011. 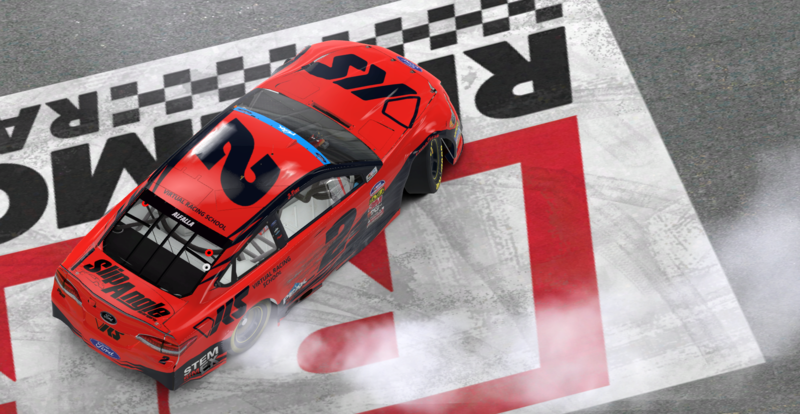 In addition to that, there’s only ever been one driver to successfully defend a championship in the NASCAR PEAK Antifreeze iRacing Series; Ray Alfalla in 2011 and 2012. It’s important to note that those titles were won under the old points format that didn’t include the elimination style playoffs. Luza looks to become the first multi-time champion in the Playoff era, and format that he’s never been beaten at. Ray Alfalla may be one of sim-racing’s most well-known names, and for good reason. 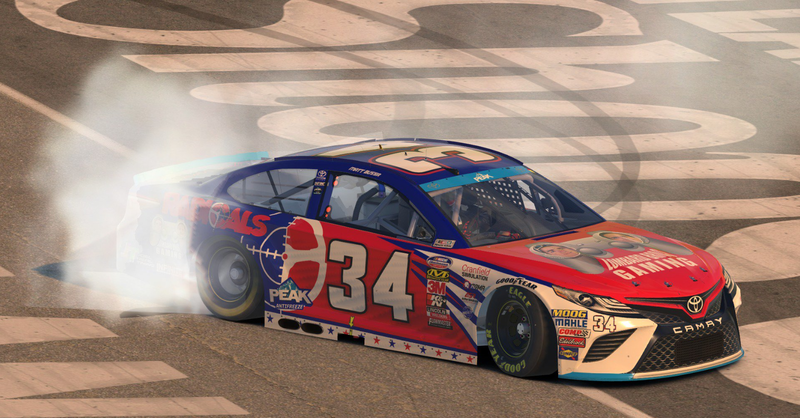 Alfalla’s more than 20 career wins in the NASCAR PEAK Antifreeze iRacing Series are the most all time and his 3 career titles in 2011, 2012 and most recently in 2016 are also a series-best. Alfalla has a 2015 win at Homestead under his belt but secured his 3rd title with a p2 finish in the season finale 2 years ago. He wrecked out of last year’s title fight early after qualifying into the Championship 4. Compared to seasons passed 2018 hasn’t been championship caliber for the driver of the #2 car having secured one lone race win from Richmond earlier this year. Alfalla only made it out of the Round of 8 as the last qualifier by a 5-point margin ahead of Nick Ottinger. Despite a somewhat slow season Alfalla has just as good a shot as any of his fellow title hopefuls to take it all on Tuesday night. If he can successfully seek redemption from last year’s unceremonious end Alfalla would secure a 4th career title and further prove he’s the best to ever do it. Whoever the champion is will be crowned an official NASCAR champion, receive a championship ring, earn $10,000 in prize money and be invited to receive their trophy on stage at Ford Championship Weekend at Homestead-Miami Speedway before the Monster Energy NASCAR Cup Series race in November. 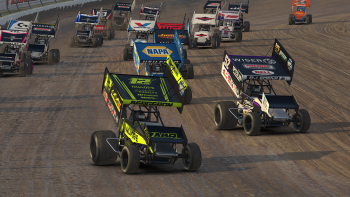 While only the Championship 4 have a shot at the title, expect a full field of nearly 40 cars to compete for the race win and keep things interesting throughout the 167-lap affair. 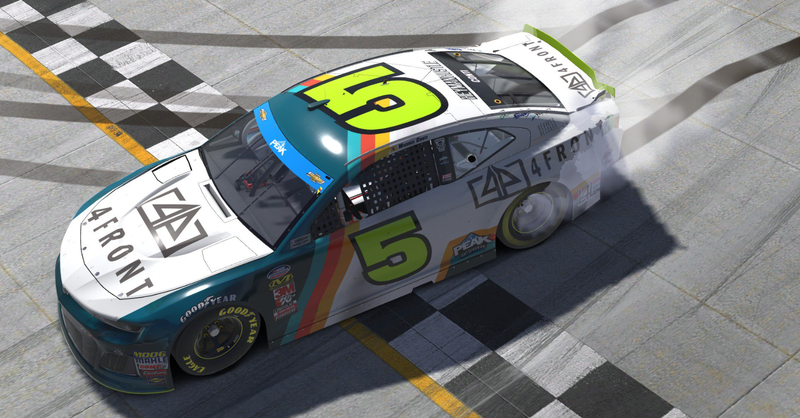 You can watch this year’s NASCAR PEAK Antifreeze iRacing Series championship race on Tuesday, October 23 with live coverage on iRacing.com/Live and the iRacing eSports Network beginning at 9:00pm EDT.